Hundreds of volunteers helped to clean up the Spicket River and the Greenway. We hope you will join us next year! We welcome volunteers of all ages, so bring the whole family! We also welcome businesses, churches, schools, and community organizations to volunteer as groups. Sponsorship opportunities are still available. Please contact info@groundworklawrence.org if you want to volunteer, would like to lead a volunteer group, or for sponsorship opportunities. 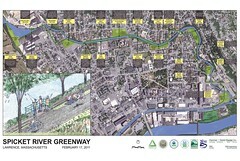 The Spicket River Greenway, envisioned by our community as a three-mile long “emerald bracelet” of green spaces and walking paths that connect parks and neighborhoods, represents a series of infrastructure, program, and stewardship investments made by Groundwork Lawrence and the City of Lawrence that are helping to meet the many challenges facing our community. A former mill city in northeastern Massachusetts, Lawrence residents experience high rates of poverty, unemployment, foreclosure, and preventable disease, especially among our lowest-income Latinos who comprise over 70% of our population. 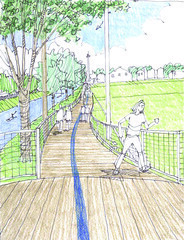 The Greenway vision, derived from a multi-year collaborative planning effort led by Groundwork, was identified first in 1998 and continues to serve as a guiding strategy for achieving multiple goals associated with creating a more healthy community. With staunch public support for better riverfront and recreational access, increased walkability, and a healthier natural resource habitat in mind, Groundwork Lawrence has led a persistent, multi-faceted campaign to: advocate for enforcement efforts against illegal dumping with a youth-led Clean Spicket Campaign; raise awareness about the river and its recreational potential; clear invasive species from the river’s edge; improve its habitat with newly-planted natives; and challenge the community to engage in direct action to wholly reclaim our Spicket River. Groundwork Lawrence’s and our partners’ investments in the Spicket River Cleanup over the past few years have helped propel our multi-year Spicket River Greenway campaign, too. Since 2002, Groundwork has engaged over 6,000 residents, students, and local corporations in clearing 110+ tons of debris and over 3,650 tires from the banks of the Spicket River with eleven annual Cleanups. Concurrently, Groundwork has served as project manager to the City of Lawrence, and as such, has leveraged millions in public funds and facilitated the design and construction of four new parks along the Spicket River, including two prominent brownfield-to-park transformations.